Two artists, Jeffrey Cortland Jones, from Ohio, USA and Michael Craik based in Fife, Scotland, have been brought together for this innovative exhibition of richly crafted, Abstract paintings which complement each other perfectly. Michael Craik studied Fine Art at Gray’s School of Art in Aberdeen before completing an MA in European Fine Art in Barcelona. Based at his Sea Loft studio in Kinghorn, he is a full time painter as well as enjoying gardening, and busy family life. A major award winner, his work has been exhibited throughout Europe, from Berlin to Barcelona and is represented in several corporate companies, including The Fleming Collection, Mastercard, and Coopers & Lybrand. Twenty five works are displayed together across the two light filled rooms at & Gallery, rather than shown separately, in order to compare and contrast the styles, colour and media. 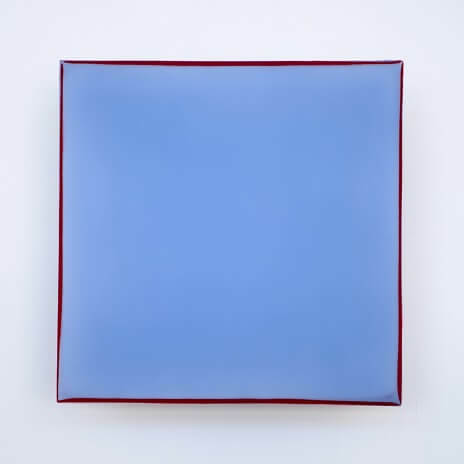 Jeffrey specialises in enamel on acrylic panel and while, on first inspection, they appear to be very simple blocks, the actual geometric shapes and subtle shade is meticulously handled. In such works as Slayer (With Desire) and Courtship, (Second Still), there are integrated boxes and squares, some almost invisible in the softest tones of white, cream and grey. Also most striking is Surface (Ritual Veil), with dark and light rectangles, visually most pleasing in its patterned, architectural structure. There is a deft use of colour too in other works which gives more of a representational aspect: X (Variant Parts) with moss green streaks of paint which could depict a grassy meadow beneath a cloudy grey sky. Given the concrete title, Seawaves, captures the blending of glossy grey, glistening green and watery, wavy blues. 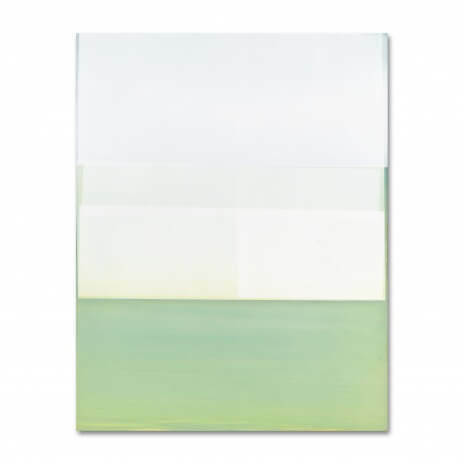 With the balance of sheer, almost transparent tones and palest pastels, apparently Cortland Jones has acquired the reputation of being an artist who paints white on white. From shades of golden corn to dove grey, the depth of colour is perfected like Farrow & Ball paint charts given quirky names such as Nancy’s Blushes, Elephant’s breath and Dorset Cream. Due to the painstaking layer by layer painterly concept, each can take around two months to complete. The result? A shining, shimmering texture which gives a beautiful translucent glow.